Canada Post seems to be having "trouble" deciding what type of medium-value definitives to issue. After the Fruit Trees (1991-1998) came only a set of 3 Stylized Maple Leafs (1999-2000) and a set of 3 Wildlife (2001). Now we have a set of 3 medium-value Traditional Trades which lasted for only one rate period (the 48c era). The 65c and $1.25 values were issued in both coil and booklet formats. These can be differentiated apart by looking at the serpentine die cutting. 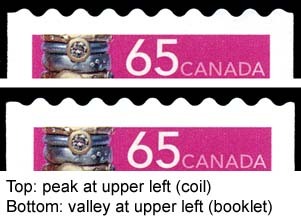 The three Trades coils have a "peak at upper left" while the two booklet stamps have a "valley at upper left". The two Trades booklet stamps come, by design, three different ways based on the appearance of ink colour on the tips of the serpentine die cuts. This is due to the position of the stamp within the booklet pane. 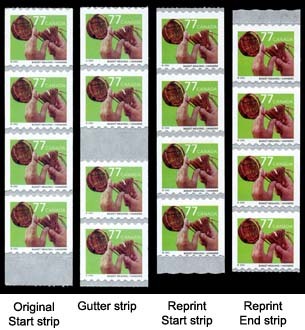 Stamps from the first row of the pane have coloured "perfs" at both the top and bottom; stamps from the second row have coloured "perfs" at the top only; stamps from the third (bottom) row of the pane have coloured "perfs" only at the bottom of the stamp. The amount of colour on the tips of the die cuts may vary depending on any minor shift in the die cutting. It is possible to find a booklet stamp without any colour on the tips of the die cutting due to a significant shift in the die cutting. All three coil stamps were printed in rolls of 50 with a 10mm gutter between every 25 stamps. These should be collected in strips of 4 with the gutter centered. The original printings of the three coils, on Jan 2, 2002 had a 10mm rouletted backing paper tab at the start of the roll. A reprint (Feb 2002 for the 65c and Mar 2002 for the 77c and $1.25 stamps) came with a 5mm wavy die-cut on the starter tab. This reprint also introduced a 5mm wavy die-cut end tab. In May 2003, the 65c appeared with 5mm straight die-cut tabs at the start and end. All start and end strips should be collected in strips of 4. The three coils were shipped with display cards allowing the coil to hang from a peg on the post office wall. 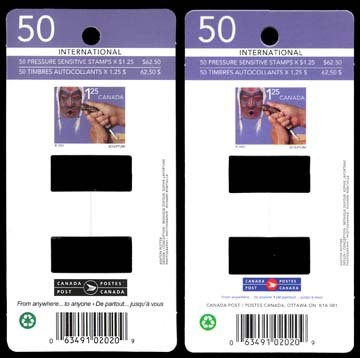 The original display card had the Canada Post logo in black & white. 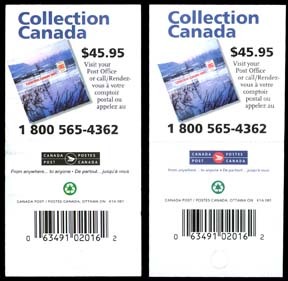 The Feb/Mar 2002 reprints introduced a new display card where the Canada Post logo is in colour. A reprint of the booklets in May 2002 resulted in a subtle change on the booklet cover. The Canada post logo was changed from black & white to colour.